That’s the thought going through my mind as I drive into Coyote Creek State Park. I park out of the way and hurry to open the side door of the PTV. The crew wants out! Bridget and Spike scramble to the ground to stand amazed at this new world. We are in a small valley of green. Coyote Road caused weight to shift to the rear of the PTV! 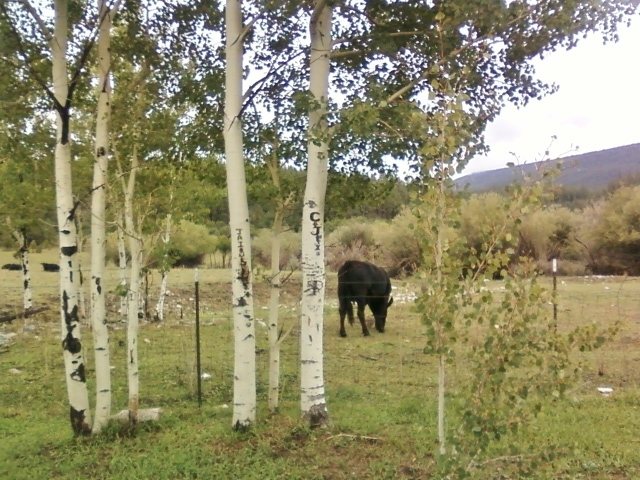 Against a mountain backdrop, in the foreground to the left, black cows graze behind a stand of aspens. To the right a soft meadow awaits. I want to see Coyote Creek! We walk past the campsite area (only one other camper is here!) 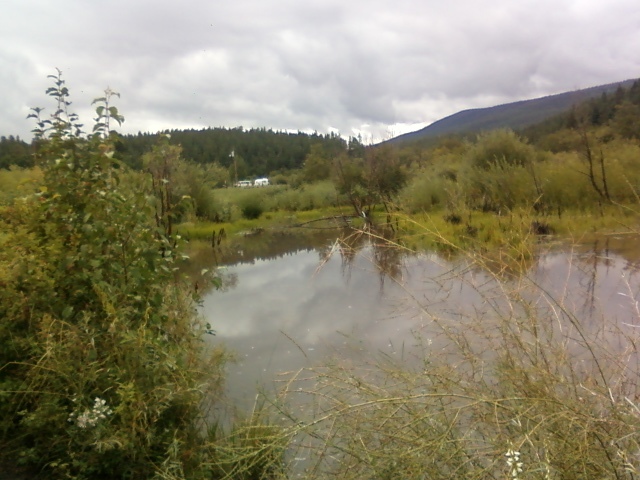 to find the creek flowing across the gravel and stone road that leads to the group shelter on the other side. 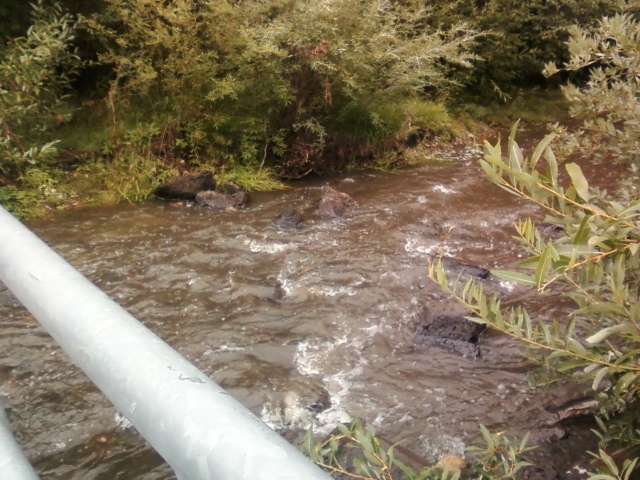 We follow the creek downstream to stand over it on a small bridge. 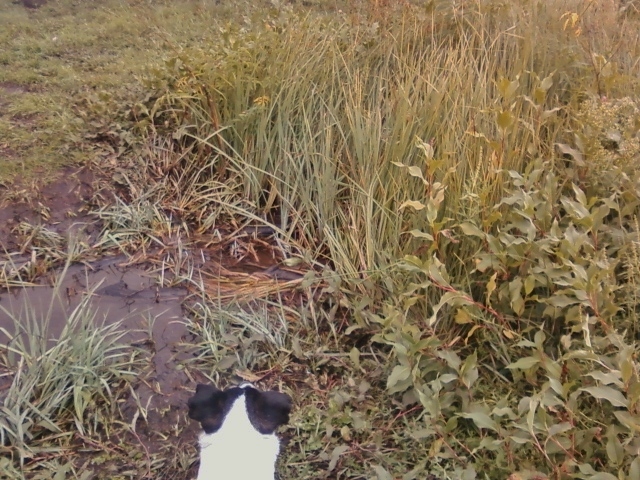 Spike, of course, has to go down the bank and stand in the flowing water. I give him a minute, then pull him back up onto the bridge. All at once I’m aware of the scent of the woodland, the freshness of the air, the wildflowers all around, the evergreens on the steep hill, the round stones of the creek bed, the sound of the creek. Everything vividly reminds me of happy explorations of the woods and streams around my childhood home which I haven’t seen in over 45 years. I briefly think back to my recent five-days-a-week-at-a-job-I-despise life. I remember the many times I looked wistfully at photos of places like the one I’m now standing in, and promised myself . . . someday, someday! What an exquisite and peaceful place this is! Suddenly I’m overtaken with emotion. I rest my forehead in my arms on the railing, look down at the stream through the supports, and break into sobs. Dear God, it’s been a long, hard road getting here! I’m not talking only about the seven years of planning that I’ve written about in previous entries on this blog. I mean my entire life. 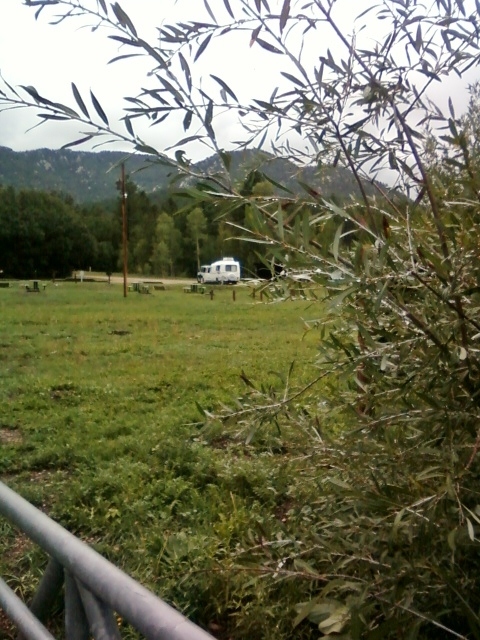 I glance back through the trees and see my little home-on-wheels and the Perfect Tow Vehicle. Tears streaming down my face I let the crew pull me along the creek bank. 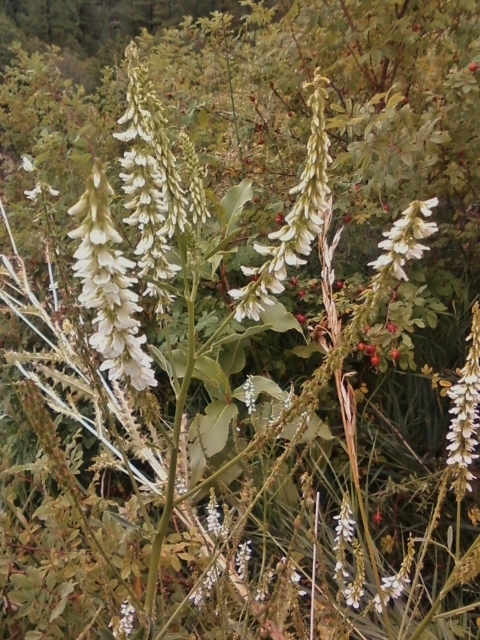 So many different wildflowers! They’re everywhere! Spike is energized, quickly moving from one new scent to another. Bridget is fascinated by the moving water. 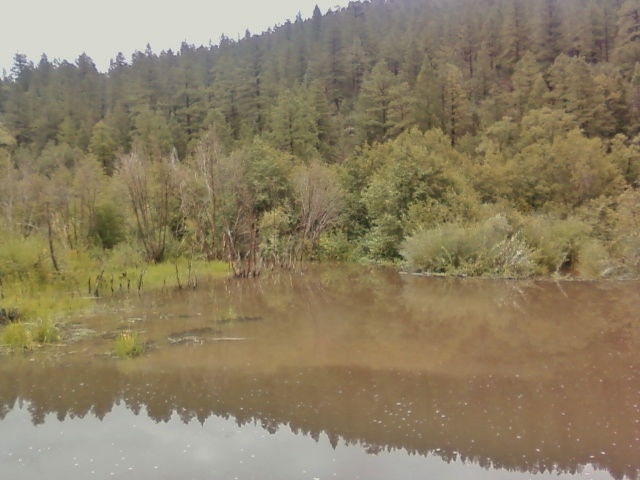 I forget my emotions and marvel at the beaver dam that slows the creek into a deep pool. Reeds grow along the opposite bank, and tree branches dip low, as if bending down for a drink. We cross the meadow on our way back to the PTV and the Casita. I heave the crew into the PTV, pick out a campsite on the end, and back in. I check the bubble levels . . . perfectly level! 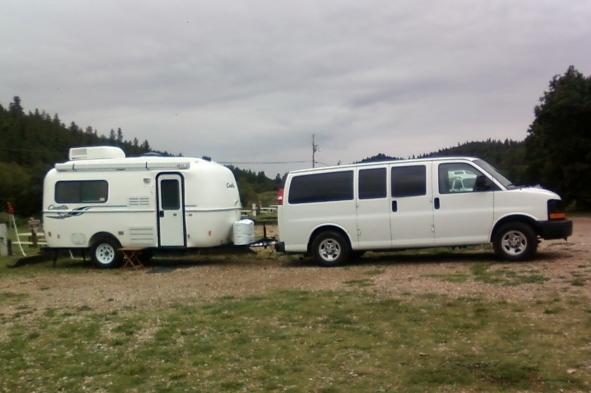 I move the crew to the Casita, chock the wheels, and complete the hook-ups. It’s about 12:30 and I’m getting hungry. I cook up a batch of beans with tomatoes and green chilies to pour over rice (my mainstay recipe these days!). I get the exercise pen out of the PTV and set it up around the picnic table. I eat my lunch with Bridget and Spike at my feet under the table, while enjoying the beautiful view of the field and mountain before me. As the crew hops in the Casita, I fill out the self-pay envelope, inserting a check for $16. We’ll stay four days, Thursday through Sunday. The crew is excited to take another walk. We investigate the black cows and follow a short trail in the woods. The creek lures us back for more discoveries. Spike dives into the reeds. 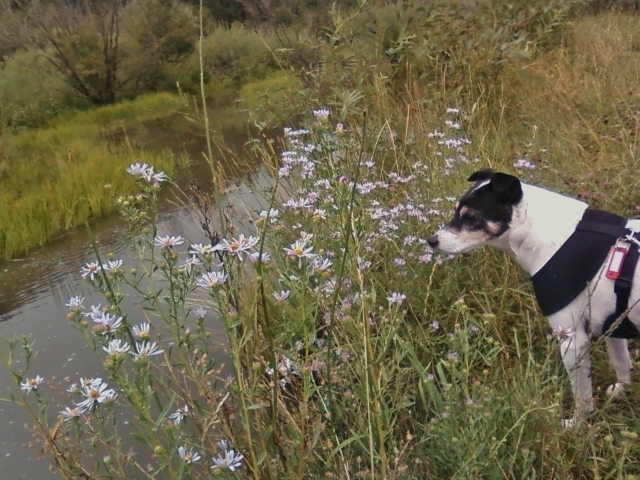 In the meadow he frantically digs toward an underground creature, until I give a strong pull on his leash. Bridget does some cute, scampering moves across the soft grass. We get back to the Casita and I look at the crew. Bridget’s paws are perfectly white and pristine clean. 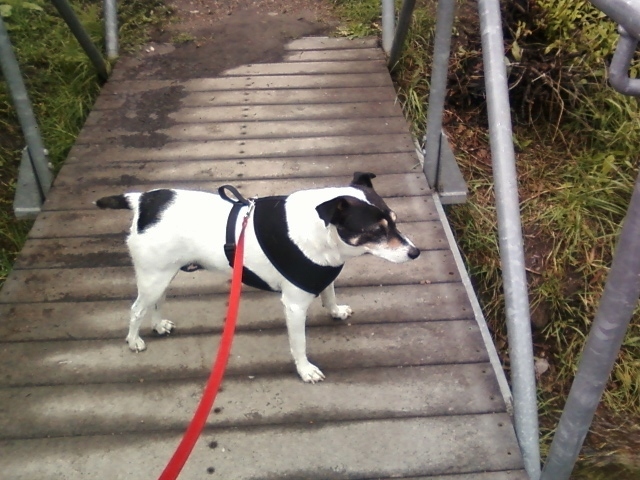 Spike, on the other hand, is covered in black mud halfway up his legs. He looks up at me. His snout is smudged with black dirt. I laugh out loud. I grab a towel out of the PTV and pull Spike over to the outside shower. Oh dear, I haven’t turned on the hot water heater. Oh well, Spike is a tough guy. He struggles at first, then realizes it’s only water, and lets me clean him up. Inside I make a futile attempt to contact the outside world. A thunderstorm rolls in over the mountain around 8 o’clock. It settles down to a steady rain all night long. The crew is deep in sleep. It’s like lying next to two sacks of flour. No movement at all. Don’t need to turn on the heat with these two alongside. The rain taps the roof as I ponder our good fortune. Spike returns to the scene of his crime! Here we are . . . no phone, no internet, no television, no contact with the outside world. We’ll be fine. Tomorrow I’ll look up some of the names of those flowers and maybe we’ll take a hike. This entry was posted in Casita, Spike The CoPilot, Tow Vehicle and tagged campground, camping, Coyote Creek State Park, flowers, New Mexico. Bookmark the permalink. 38 Responses to I love Coyote Creek! Your blog made me cry too…. thank you for your heartfelt posting of what it means to you to go find yourself in this new adventurous lifestyle. I even read your blog aloud to Steve and had him come to see your pictures too! Before I went to sleep I was thinking about you reading my blog aloud. That’s really something. Thanks for letting me know! Good for you!!!!!!! You make the two of us and our dog and cat very happy!!!!!! Hi, Roger and Dianne . . . Glad you feel happy about my adventures! Congratulations Sue. Looks like all that hard work and planning has paid off bigtime! Thanks, Phil. It really is nice when things work out the way you hoped and planned for! I’m teary-eyed too! I imagine the combination of beauty + freedom would result in an emotional sucker-punch. Love the shot of your campsite across the water! I won’t call you a pioneer again so soon but … you are. Good call on the outside shower option! Yeah, I had Spike in mind when I ordered the outside shower. I knew it’d come in handy! I was surprised at my emotional reaction until I reflected on it . . .
Life is good, Sue, life is good. Yes, life is good. I hope it’s good for you in Vermont. Oh, Sue. Thanks for sharing your incredible new life with us. I am in awe of your spirit and freedom. I underestimated the readers of this blog. You guys really “got” what I was feeling at that moment! Kinda makes up for the heat in Texas and the not so wonderful campgrounds you’ve already been too. Camping at Hord’s Creek and Brantley and Santa Rosa and Storrie Lake provides the contrast to make the beauty of Coyote Creek stand out. Great post. So you had the same feelings? Gratitude and happiness . . . a feeling of having arrived. I’m glad you realized your dream and I hope you keep enjoying life. Susan, I cried too. My dear, sweet, loving sister…..You will never know how much I love you, have loved you and will always love you. I am SO VERY HAPPY that you finally made it to happiness. Oh, I’m sorry I made you cry! Thanks for writing here. I love you, too! Yes, that place is really nice great camping. Did you see the fish ? If you look carefully when your on the bridge you may see some big trout in those waters 🙂 There are other state parks further north into the mountains that are just as beautiful-you have hit pay dirt ! So glad you’re having a grand experience reminds me of my experience there. 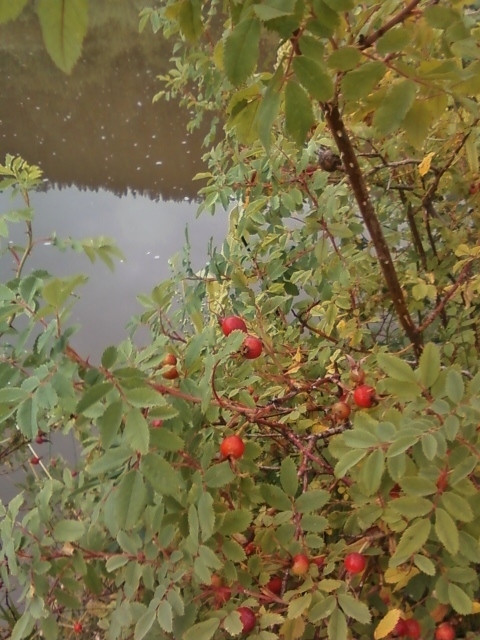 No, I didn’t see the fish, but they were probably there and not cooperating with my bifocals! I’m glad I brought back memories . . .
Susan, even before you said it I knew where you were going as you mentioned that this great campground reminds you of where you grew up. Your description sounds much like the Cambridge, NY valley and all that we enjoyed there. Through your words, I can tell that you have arrived!! Enjoy the view. It sounds beautiful. Yes, the childhood memories of Cambridge, its woods and streams that used to be my playground . 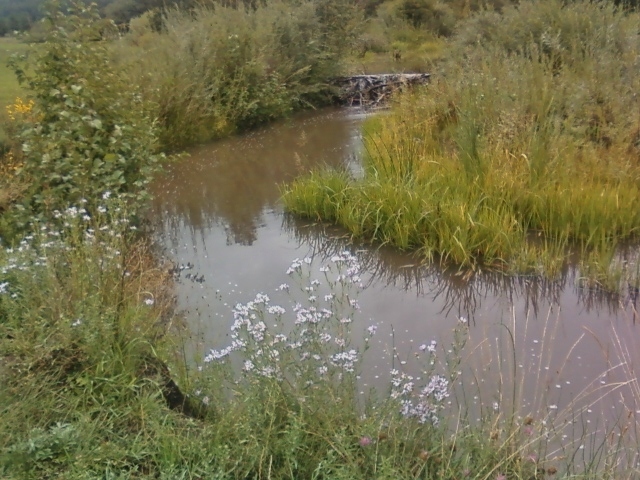 . . that was brought back to me by the natural beauty of Coyote Creek. What an awesome experience you had. I do believe that you were just Born today into a New Life! I celebrate your new awareness to the Beauty of Mother Earth. Very nice pics to go along with your writings. The world awaits you! It’s hard to take a bad picture of such a place! Every day I’m more impressed and aware of what a wonderful planet we inhabit. Parker kind of took the words right out of my mouth. Your pictures are so beautiful. It kind of reminds me of where I am. Today took a trip to Fort Apache, the golden fields and meadows are bright with color. When I set out on my little voyage 2 years ago all I wanted was to escape. Although I am not a full timer I often think I would love it and still may do it If I could sell my house. Keep traveling and posting I will be along for the ride. Always good to hear from you, JoJo! Hi, Barrie . . . It was nice to be “cut off from the outside world” for a while . . . until I started to wonder about what bills needed to paid online! There it is! That’s the beautiful scenery I’ve been waiting for you to post, Sue. And it’s the scenery I know I’ll head toward when I retire and become a full-timer in a few years. I’m so envious of your adventures and blessed that you share them with the world. You’ve probably mentioned it, but I’ve already forgotten. Do you have specific warmer areas in mind for winter, or are you one-day-at-a-timing it? I’m going to head south, of course. I would like to stay in NM. Even though NM has freezing temperatures, they rarely last long enough to hurt pipes. I’ll have to be careful. There will be snow probably, but that’s not a big deal. I have stayed at Coyote Creek. 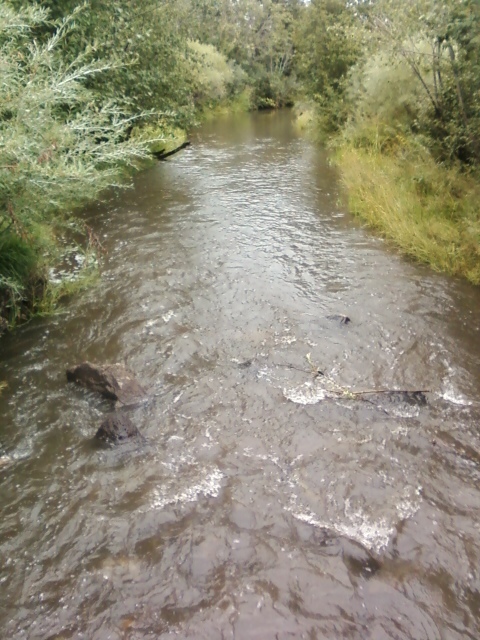 Coyote Creek is not heaven. It’s just on the road to heaven. Keep driving. It gets better. Speaking of driving, 434 north to Angel Fire out of Coyote Creek. goes up a narrow canyon, with many blind corners. Be careful. Some of the locals go way to fast in there, and don’t stay in their lane. I was in a much larger trailer, though, so maybe it won’t trouble the PTV. Angel Fire has an interesting Viet Nam War memorial. Heaven on earth is different for every individual. Undoubtedly there are more spectacular places, more beautiful, more dramatic, more everything. This place touched my heart. Yeah, I found out about that road! Your post brought tears to my eyes as it did so many other readers. For me to ever realize my dream to do what you are doing seems soooo far off…and at times a wonder if it is just a fantasy. In some ways it helps to know it took 7 years for you to be where you are…and as you said also…really your whole life…I don’t feel like a cheerleader today…more like a moody “wannabe”! Your blog does give me some hope however…so very glad you are living your dream! How cool is that?! I will be praying that God continue to bless you with JOY and protect you from harm! I’m glad my blog gives you hope for your dream coming true. Don’t be discouraged. I used to tell myself, sometimes out loud, “Well, this brings me one step closer.” . . such as when I made a big credit card payment or I sold a piece of furniture or I bought some piece of equipment for fulltiming. Do everything you can to keep your dream alive. I even put scenes of NM and pics of Casitas as screensavers on my home and work computers. Anything to keep the dream alive and in focus. Good luck! It’s worth the effort and the wait. That’s my plan…to turn one of my bedrooms into a dream room to collect/decorate for my dream! Thanks for the encouragement! It will probably be 7 years for me as well before I can afford my dream…maybe sooner…only time will tell. The night is really cool here in Birmingham…some young neighbors are burning a fire…kinda pushing things a bit to have a fire…but I can relate….ready for hot fires and crock pot soups! Love the sound of your lazy days and nights as they unfold. E N J O Y!!! What a gift you have been given…the freedom to follow your dream. And what a gift you are giving back in sharing that dream with others. Your words paint a picture as true as that captured by the best camera and yes, I got misty eyed too. Thank you for sharing your life so freely – and that of your canine crew of course.